Disposed of for $1,850, WPK spent several years flying out of Sault Ste Marie, Ontario. 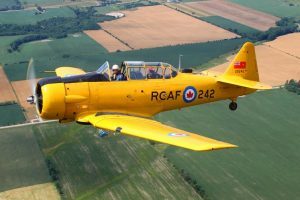 Jim Vernon of Oakville purchased WPK in the early 1970’s and was later flown as the #2 position in a 4-plane Goldilocks Formation for the Canadian Warplane Heritage Museum. In 1978, it was bought by Bob Hewitt and Norm and Kent Beckham based out of Woodstock. WPK was purchased by CHAA in 1989. The engine was overhauled in 1991 for $27,000.